Wright, H. (2017) Outside Time: A Personal History of Prison Farming and Gardening. Placewise Press, Devon, UK. 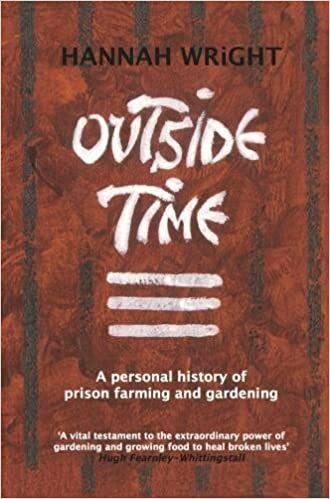 Outside Time combines personal narrative with social history to trace the rise and fall (and tentative revival) of prison farming and horticulture programs in England and Wales over the past half-century. Whereas just two decades ago, inmates at dozens of institutions under HM Prison Farm and Gardens operated the nation’s third largest farming enterprise, these farms have been dismantled and sold off under neoliberal pressures to cut costs and provide job training for a more urbanized country. Only in the past decade, under the banner of sustainability, are gardening programs beginning to make a comeback. Outside Time is a love letter to the old ways and a call for its return. Having grown up herself the daughter of a prison farm manager, the author writes with deep affection and nostalgia for this history. Her passion and personal connections – Wright has known many of her interviewees for years – bring the book a level of empirical detail, texture, and feeling that would be difficult for most to convey. Many of her interviews take a life history approach and read like direct transcripts. This fine-grained detail, however, makes Outside Time a difficult and stumbling read. In truth, as a social scientist and structural thinker, I often found the book frustrating and short-sighted. There is little by way of summary, analysis, theory, or self-reflexivity. These were not the author’s goal, however, and Outside Time is a book to be read on its own terms. It offers insight into a side of prisons often overlooked – agricultural and gardening work programs – from the perspective of those who ran them. It is a detailed account of a little-known history that prison policymakers, agriculturalists, and scholars of prison bureaucracy will find intriguing. Critical prison scholars have labored to unpack the subjectifying work of prisons on the people caged inside them (Alford, 2000; Moran, 2015), as well as the people who staff them (Liebling et al., 2011). This latter literature, however, has largely focused on security staff and administrators. Wright instead offers insight into the lifeworld and worldviews of prison farm managers. These people are farmers first and prison employees second. The farm managers operated semi-autonomously and separate from Prison Industries, which employed all other inmate workers. They worked outside the prison walls, often seen by wardens as an occasionally obnoxious, occasionally charming anomaly. This social distinction and physical distance, Wright contends, allowed inmates to develop relationships with farm managers that were less hierarchical than those with guards. Farm managers did not wear prison uniforms. They shared in the work and toiled in the same muck as inmates. Though Wright gestures toward these hierarchies of power, Outside Time ultimately reenacts these same imbalances in its telling. Several early chapters are filled with sensationalist accounts of prisoner escapes and violence. Wright repeatedly reduces people in prison to “criminals” or “offenders.” The book includes very few accounts by actual inmates, preferring to rely on the memories of farm managers and what they think inmates thought. Though subtitled “a personal history,” Outside Time presents a seemingly comprehensive history with no discussion of its limitations of blind spots. In so doing, she creates a hierarchical history in which those with power tell the stories of those without. Outside Time is not, however, without its own politics. Wright launches the entire book as a call for the return of prison farming and the expansion of horticulture programs. Wright argues forcefully for the value of this work as a means to rehabilitate and humanize the incarcerated. Her conviction on this point is clear and heartfelt. As a years-long volunteer at a prison farming program in the United States, I have myself been told the value of prison gardening programs by formerly incarcerated friends who were able to take part. Having known the farm managers at this program, I was excited to see a book on the subject. The prison farm is a unique, even heterotopic space. Yet, I have also seen the use of these programs as means of punishment, discipline, exploitation, and (increasingly) greenwashing; realities which all haunt but go unnamed in Outside Time. Ultimately, this is a book of raw potential, to be read by those with their own analytical or political aims. I hope that others read it and write their own histories and geographies of prison farming. Carceral geographers are particularly well positioned for this task, able to inquire into the particularities of place (urban, suburban, rural prisons?) and the effects of political economy and scale (the role of the food industry and agribusiness?). In this way, Outside Time provides one more entry in an ongoing and building conversation on where prisons, food, and justice meet. Alford, C. F. (2000). What would it matter if everything Foucault said about prison were wrong? Discipline and Punish after twenty years. Theory and Society, 29(1), 125–146. Liebling, A., Price, D., & Shefer, G. (2011). The Prison Officer (2 edition). Abington, OX: Willan. Moran, D. (2015). Carceral geography: Spaces and practices of incarceration. Ashgate Publishing, Ltd.